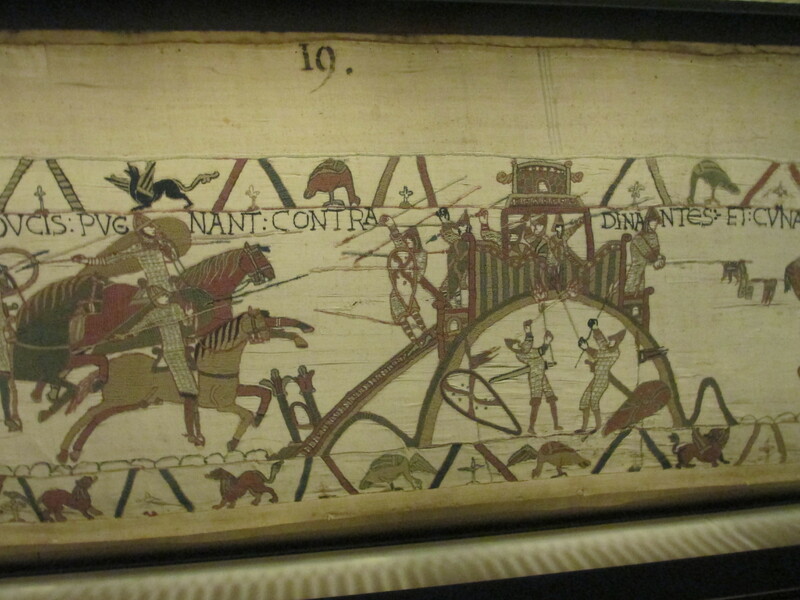 The Bayeux Tapestry. 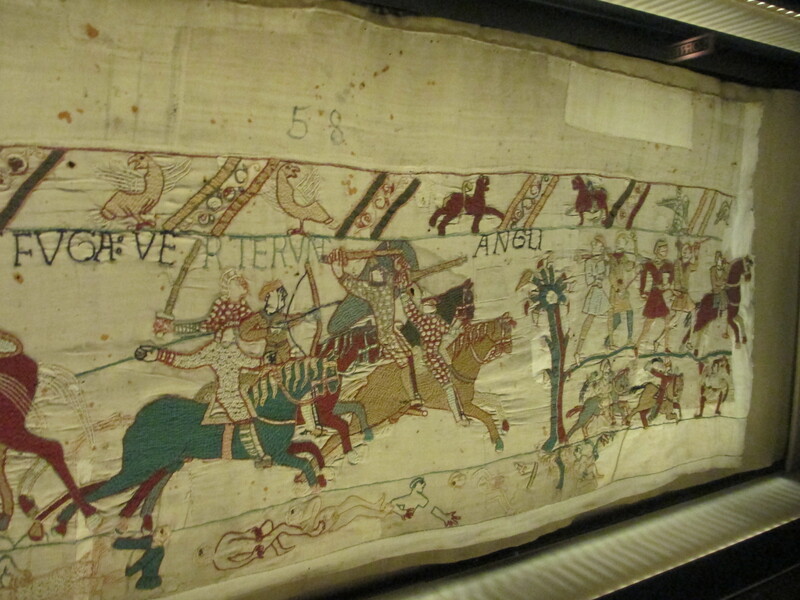 Probably the world’s best known embroidery, it covers the lead up to and the immediate aftermath of the Battle of Hastings, one of the most important battles in English history. 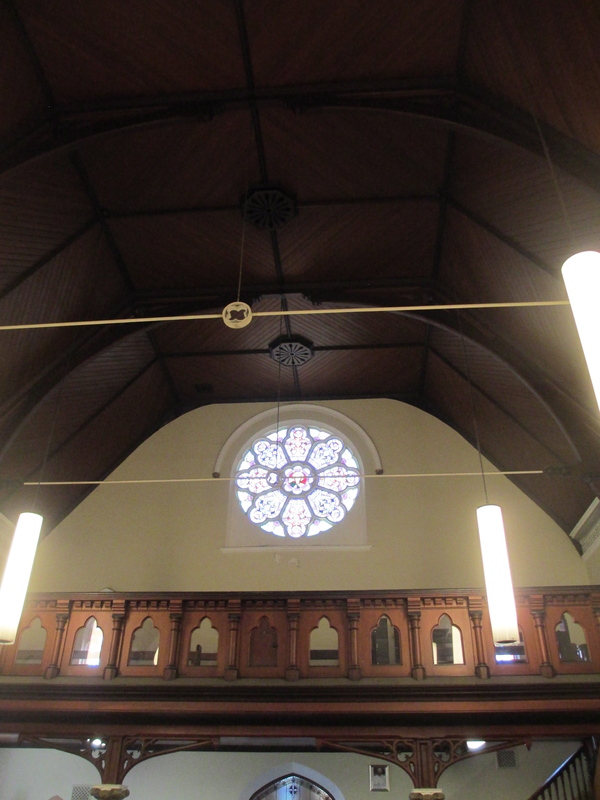 You can see a video of the tapestry below. Sorry about the heads in the way and the speed. I had to film around the tourists. 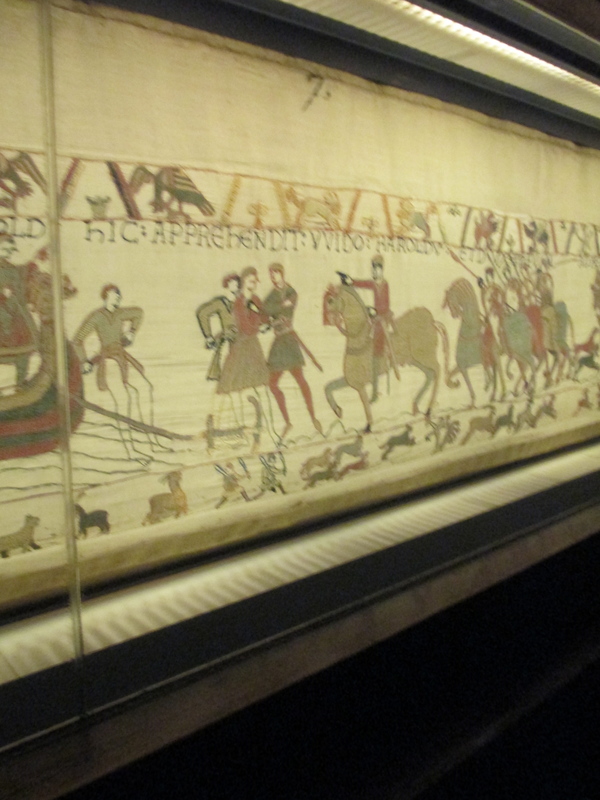 It does give you a really good idea of how long the tapestry is though. 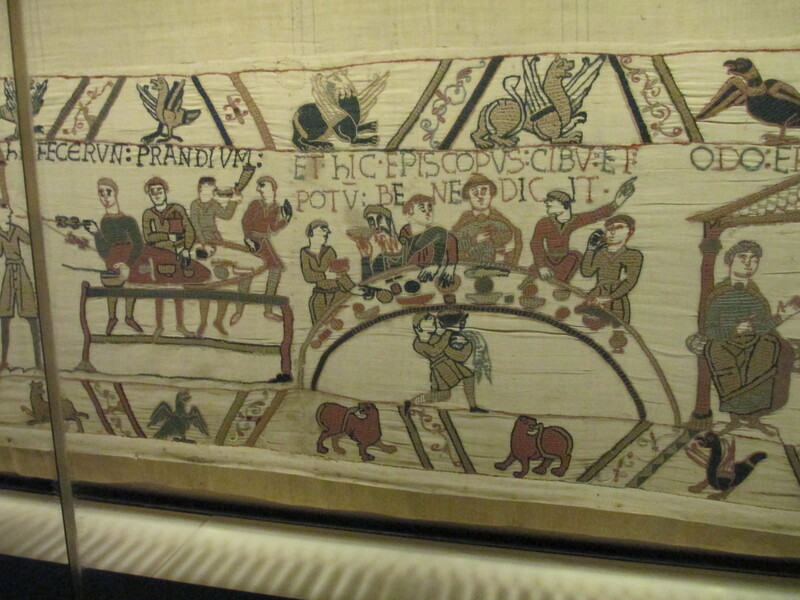 This post is going to be a combination book preview, I haven’t done one for a while, because I have two lovely and quite different books on the Bayeux Tapestry. 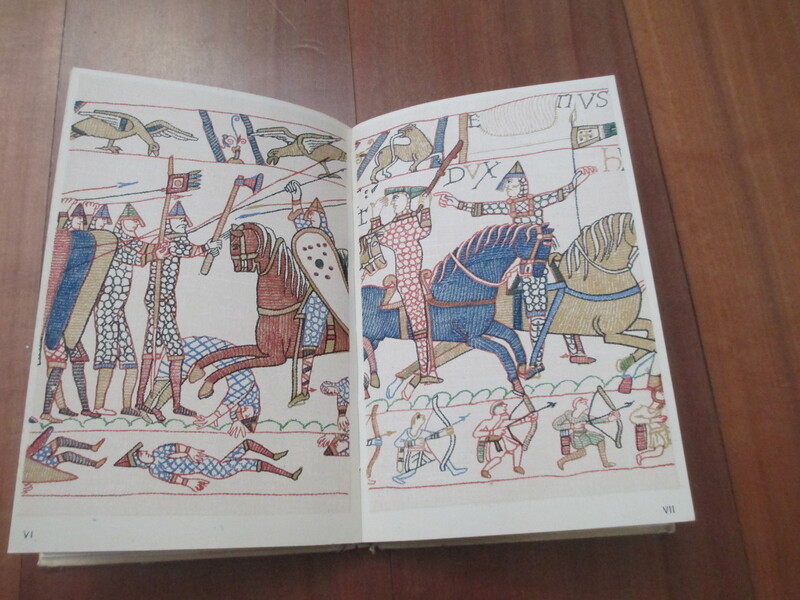 The book on the left is The Bayeux Tapestry and the Norman Invasion by Lewis Thorpe published in 1973. 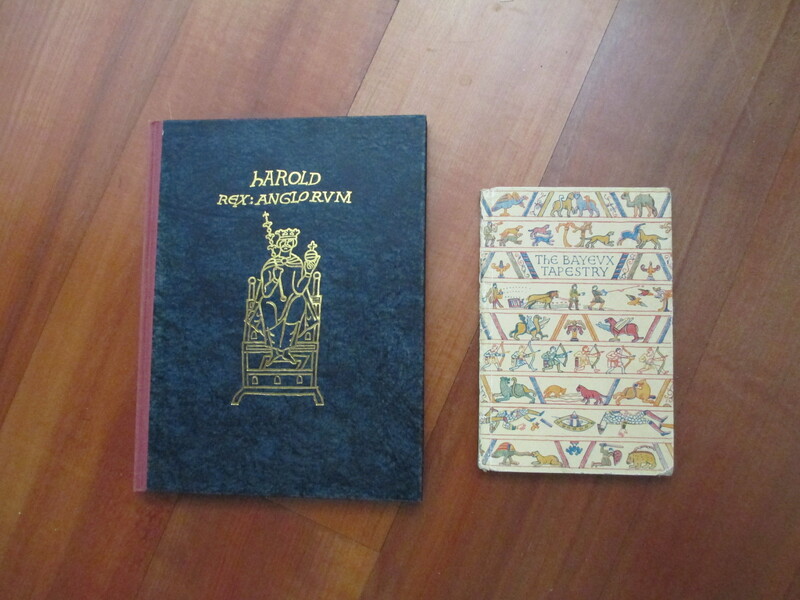 The book on the right is The Bayeux Tapestry by Eric Maclagan CBE (Director and secretary V&A) published 1943. 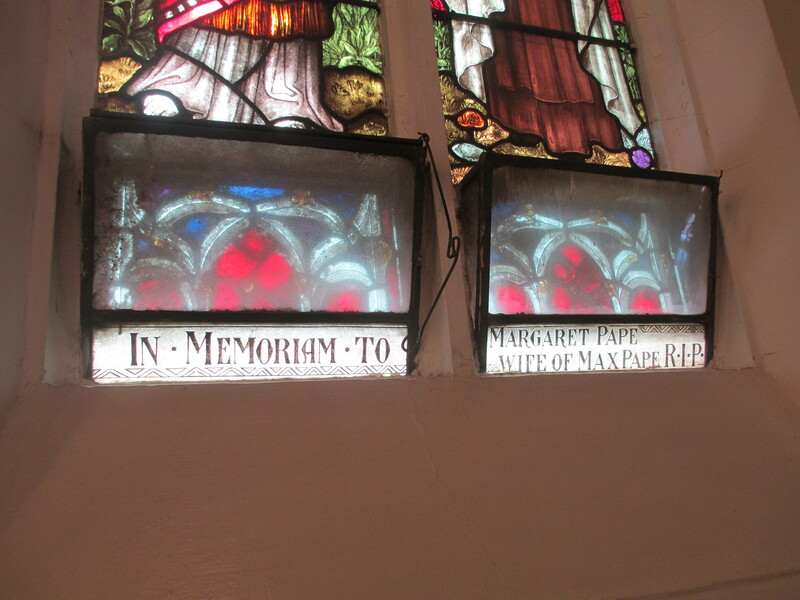 Both books give an historical background to the tapestry, though Thorpe’s has more detail. 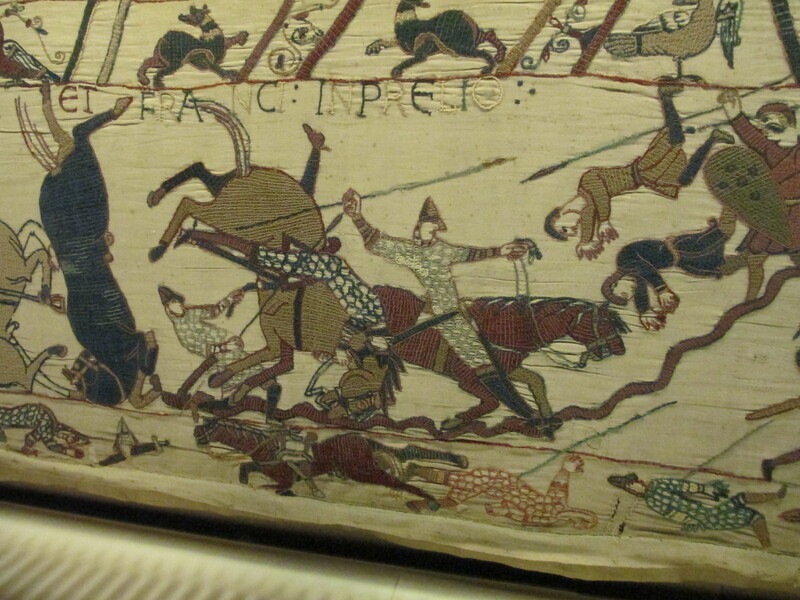 Both also have analysis of each scene of the tapestry though Maclagan’s is more detailed. 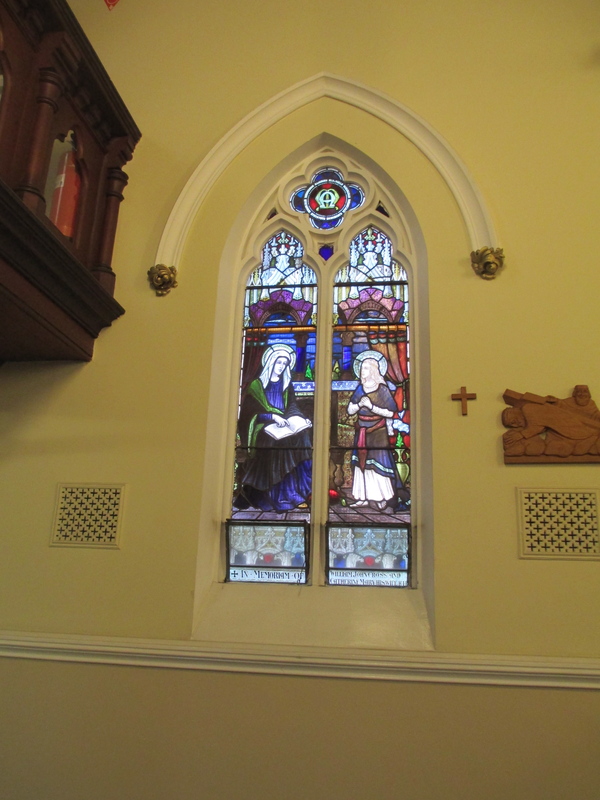 Maclagan’s focus is very specific to the tapestry while Thorpe takes a broader view. Thorpe also includes a translation of one part of William of Poitiers work History of William Duke of Normandy and King of the English. 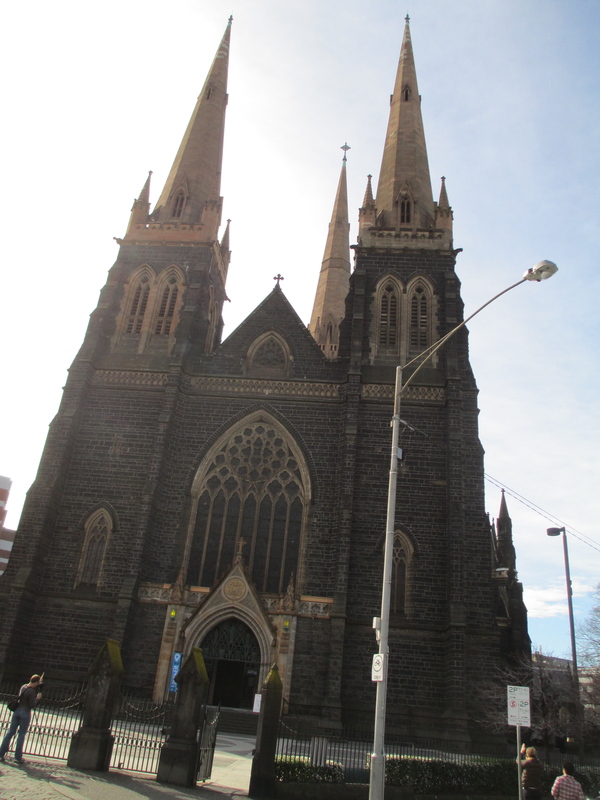 Both books are also second hand and Maclagan’s has some extra information in the front cover. Pasted there is a newspaper article discussing another tapestry. 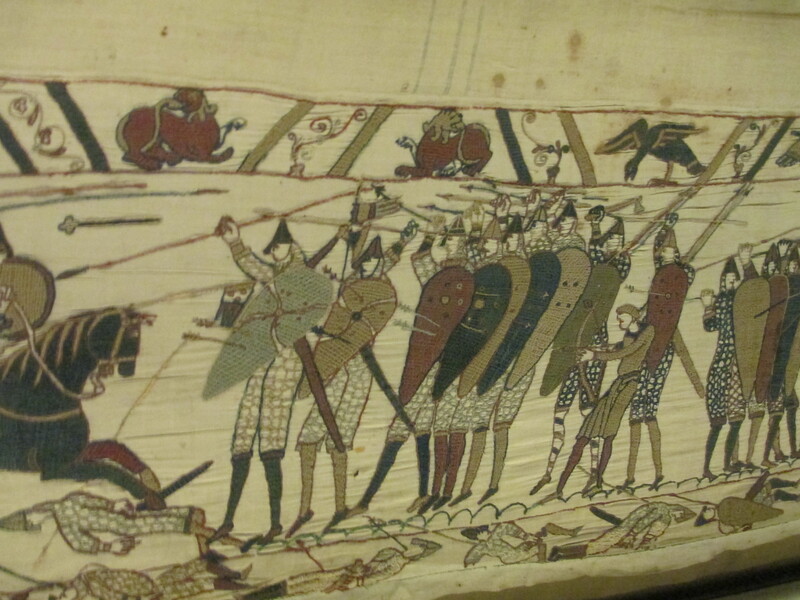 The article is from the early fifties and outlines the plan by Miss Sandell of Southampton to make a tapestry, inspired by the Bayeux Tapestry, of Southampton’s Town Quay at the Dday landings. This led me to do some research and I found what I think is the same tapestry. 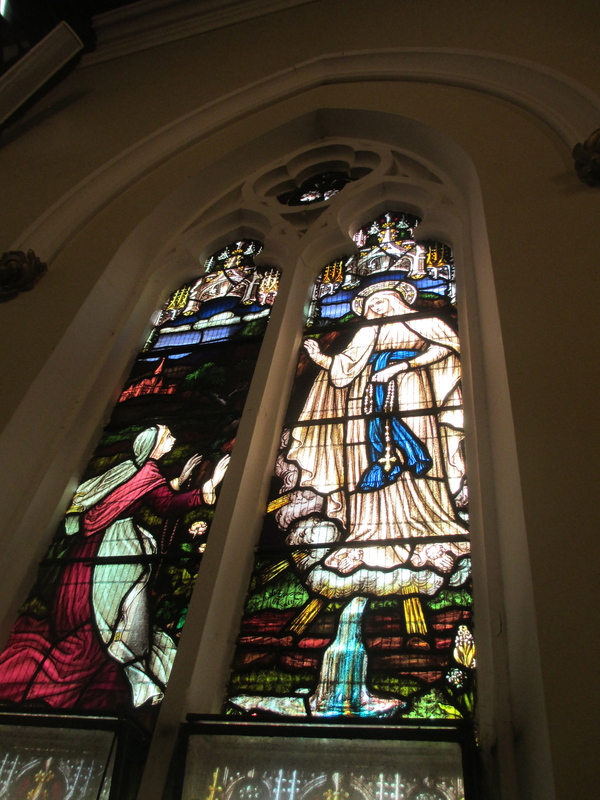 It was completed in 1953 and now hangs in the civic building in Southampton. Unfortunately I have not yet been able to find a photo. 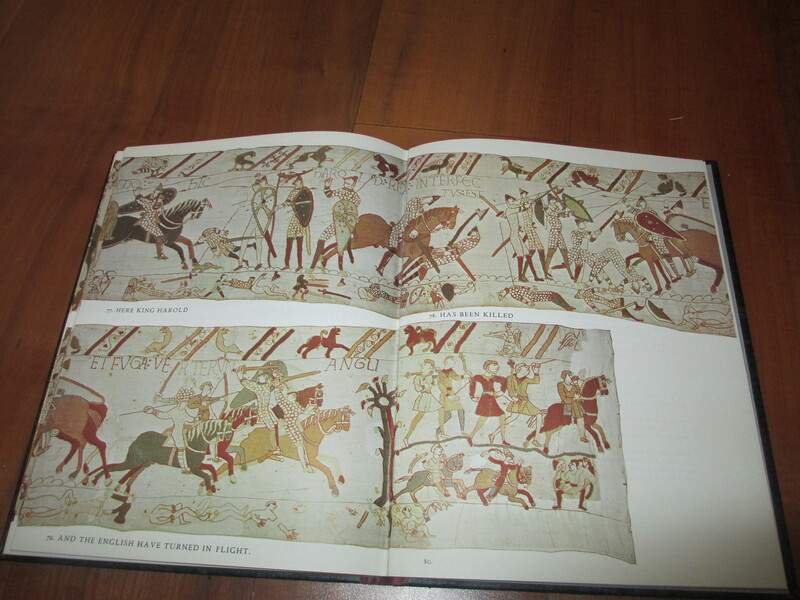 As I said both books depict the scenes of the tapestry. They do it a little differently though. 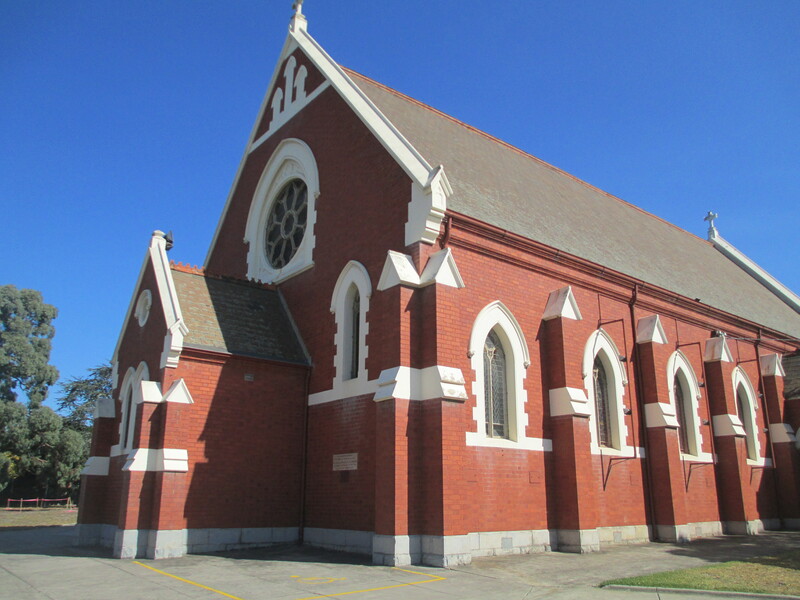 Two examples can be seen below. 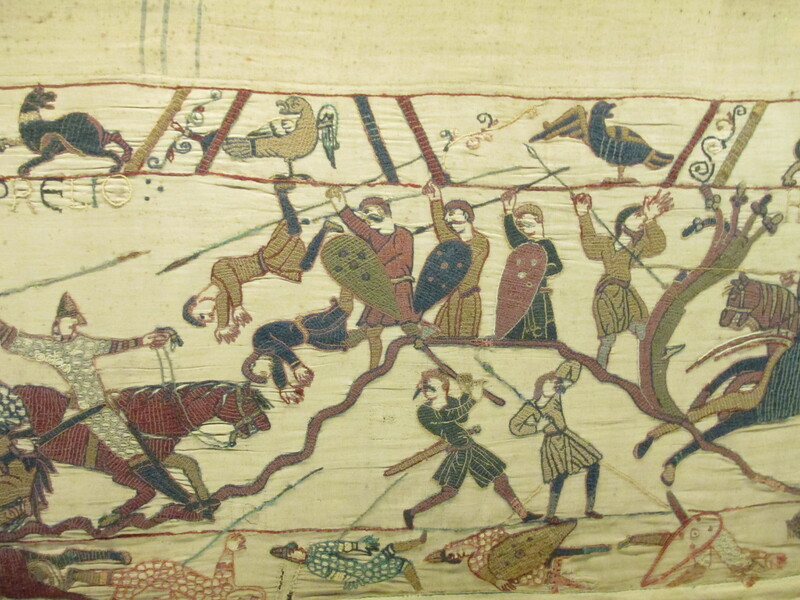 The first is a depiction of the famous scene that may or may not illustrate, it depends who you ask, King Harold getting shot in the eye with an arrow. 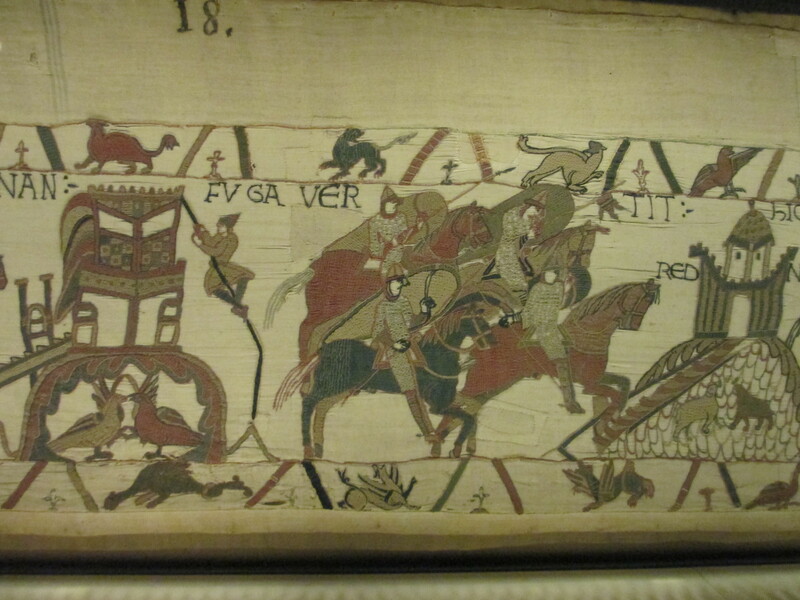 The second is a depiction of William the Conquerer showing his face to his men to prove he isn’t dead. The first picture is Thorpe’s book, and as you can see it provides a translation of the latin embroidery below each picture. 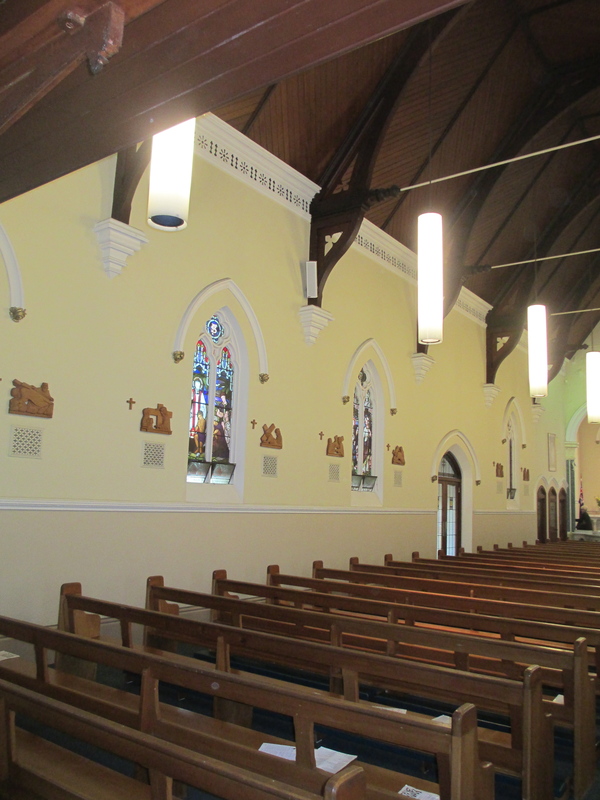 The second picture is Maclagan’s and it depicts the whole image alone, he provides a summary of the events in an earlier section. Maclagan only covers a handful of the scenes in colour where as Thorpe does all of them. There isn’t a great deal new to write about the tapestry, I’m not offering any fantastic revelations, but it is an abidingly interesting story depicted in threads. So I thought I’d narrate that here. To begin with though, it isn’t a tapestry. It’s an embroidery. 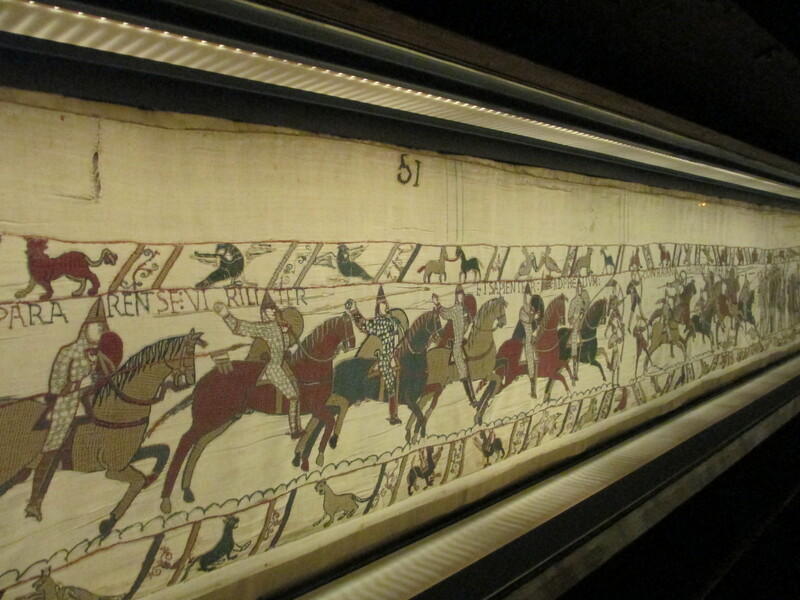 After its creation and dedication ceremony, probably in 1077, there is not much record of the tapestry. 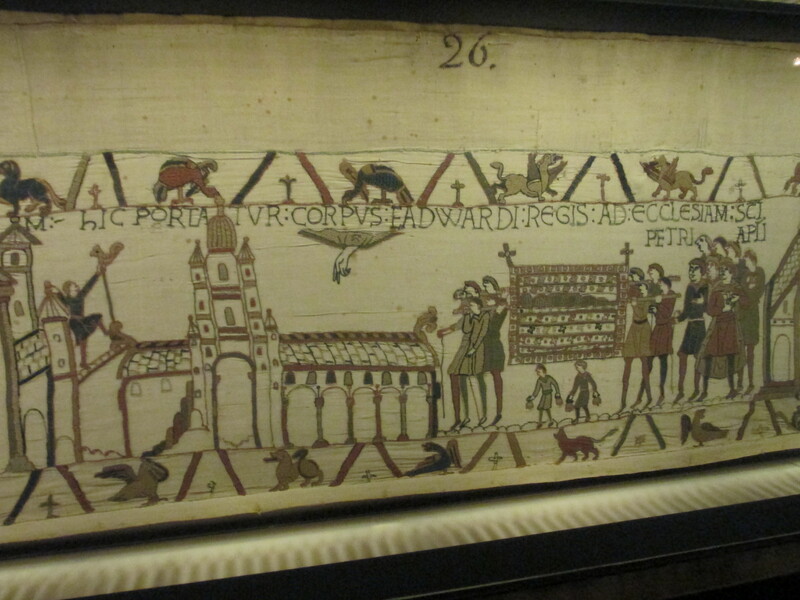 In 1476 it is specifically listed in an inventory of Bayeux Cathedral. 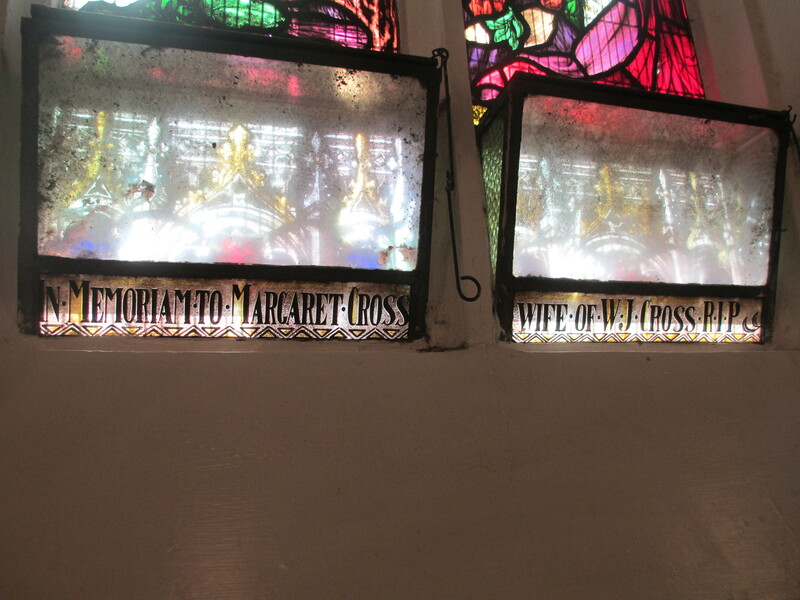 It is then mentioned in a paper in 1724 and in 1728 Dom Bertrand de Montfaucon, a Benedictine from Saint-Maur, took an interest in it and 12 months later sent someone to examine it. The drawings made of it at this time was published in Montfaucon’s book Monument de la Monarchie Francais. There were several attempts to destroy it or to use it ignobly during the French Revolution. For example it was almost used as a protective tarpaulin before a last minute reprieve. It was exhibited in the Musee de Napoleon in Paris by Napoleon. During Napoleon’s reign a comet was sighted. 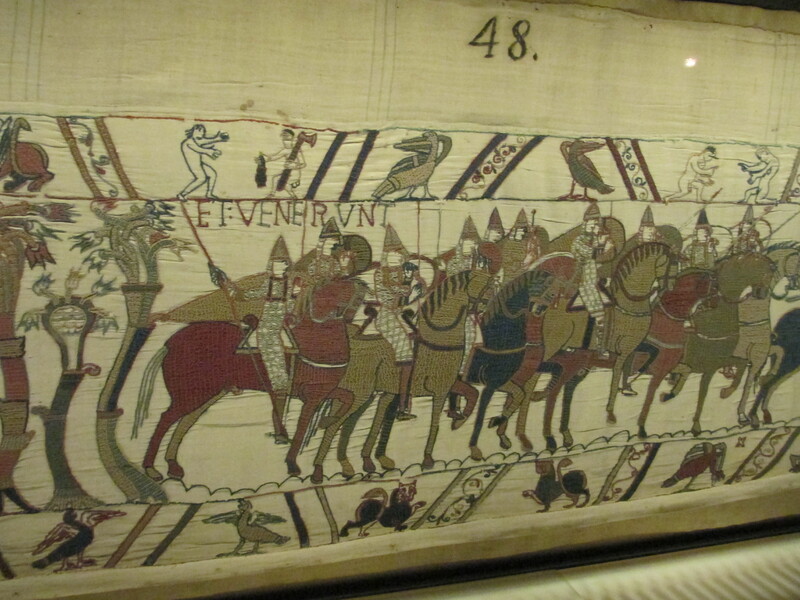 Although it wasn’t Halley’s Comet, which is depicted in the Bayeux Tapestry, it was thought that it was a good omen for an invasion of England. 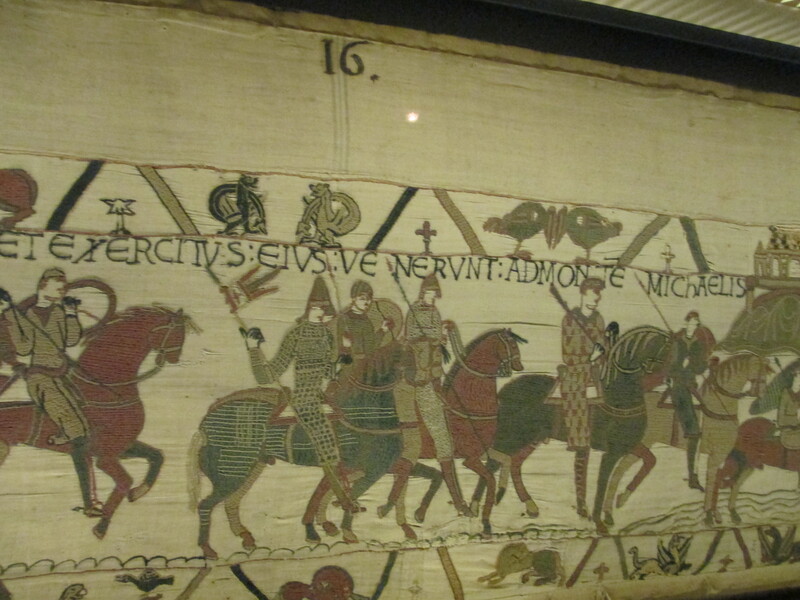 Napoleon changed his mind though and in 1804 it was returned to Bayeux where it has hung pretty much ever since, apart from a short period of time during the Franco Prussian War. Also during WWII it was spirited away to stop it being sent to Germany with other significant French art. It was also briefly exhibited in the Louvre in 1944 after the liberation of France. (Lewis, pp. 58-59). So in some ways it is somewhat of a miracle that the tapestry still exists. 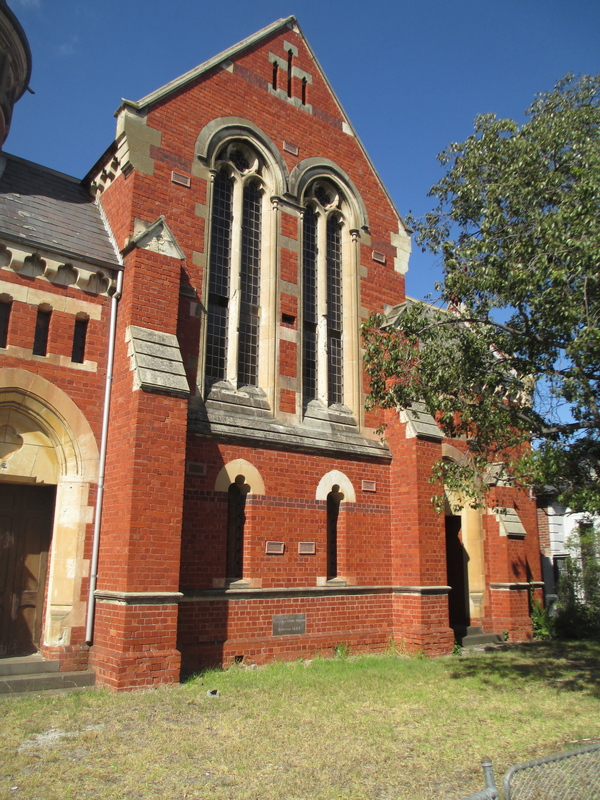 The story it depicts is very much from the Norman perspective but is still of great interest. 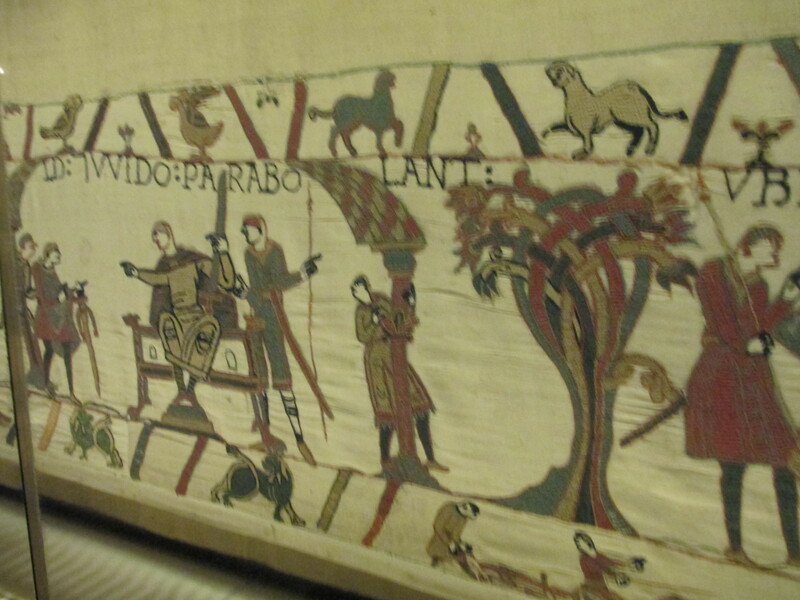 I will now set the scene for the story of the tapestry. Edward the Confessor was King of England but he had no direct heir. There were several contenders. 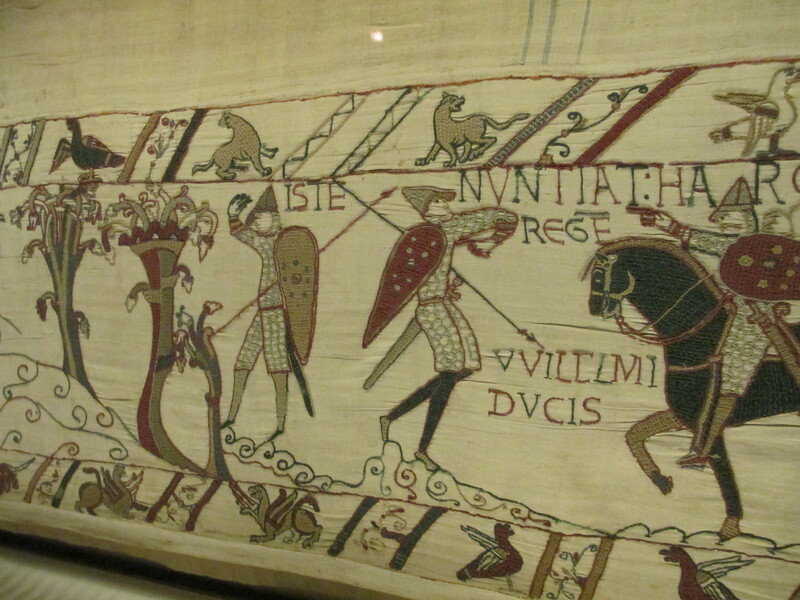 William Duke of Normandy and Harold Godwinson were the primary claimants as far as the tapestry is concerned. 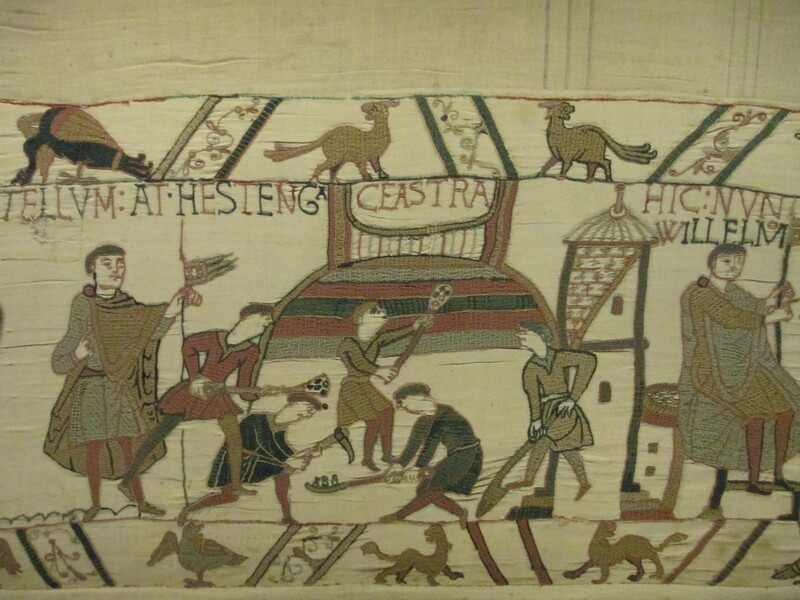 However the tapestry leaves out other contenders including Edgar the Aethling who had the best hereditary claim being descended from England’s older kings, but he was quite young and no one seemed to seriously consider him until after the Battle of Hastings. 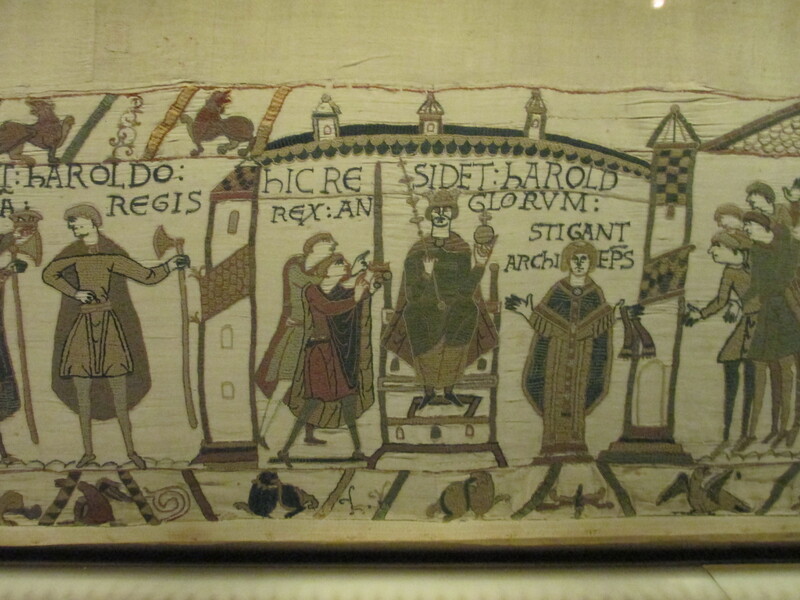 The tapestry also doesn’t depict Harald Hardrada King of Norway who made a spited attempt to claim the throne, though unsuccessfully, but more on Harald Hardrada later. 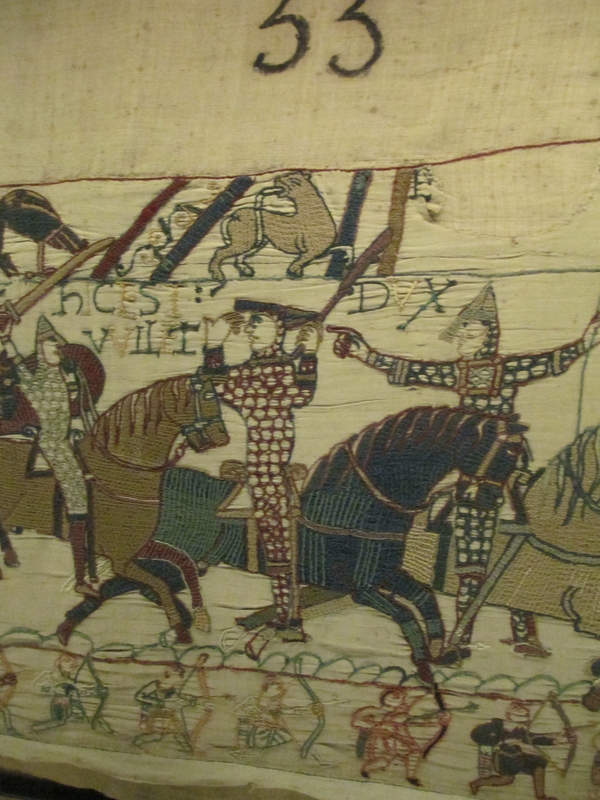 William of Normandy was related to Edward the Confessor as Edward’s mother had been Emma of Normandy who was the daughter of William of Normandy’s great grandfather. 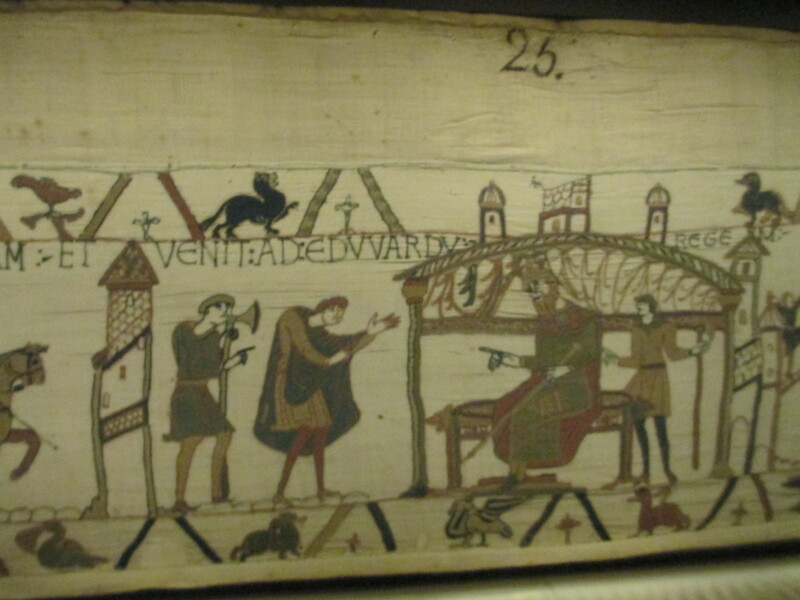 William also claimed that Edward offered him the throne in 1051. Harold Godwinson’s claim to the throne was not one of blood but rather one of power, he was the son of Earl Godwin Earl of Wessex and his sister was the wife of Edward the Confessor. Earl Godwin died in 1053 and Edward and his brothers Tostig Earl of Northumbria, Gyrth Earl of East Anglia and Leofwine , who ruled the area of the south east, wielded an immense amount of power in England. 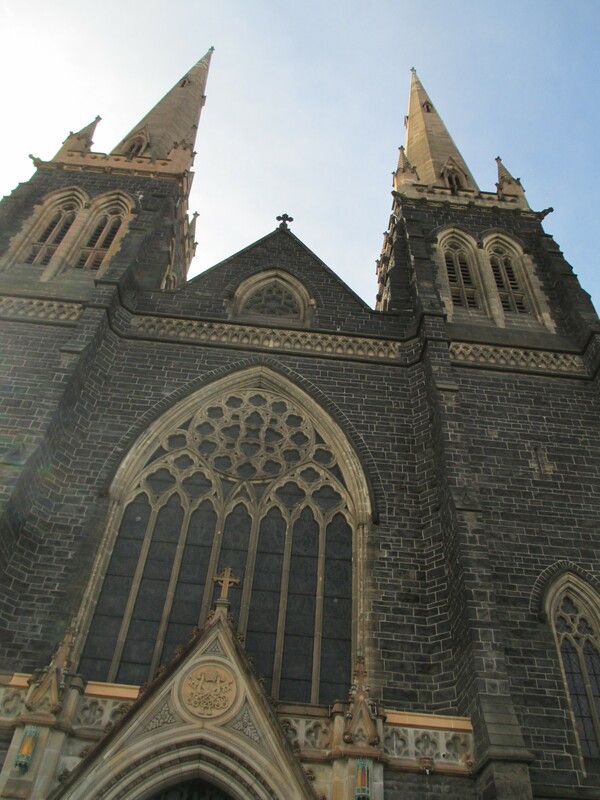 During the last 13 years of Edward’s life they were virtually ruling England. (Lewis, pp.7-8). 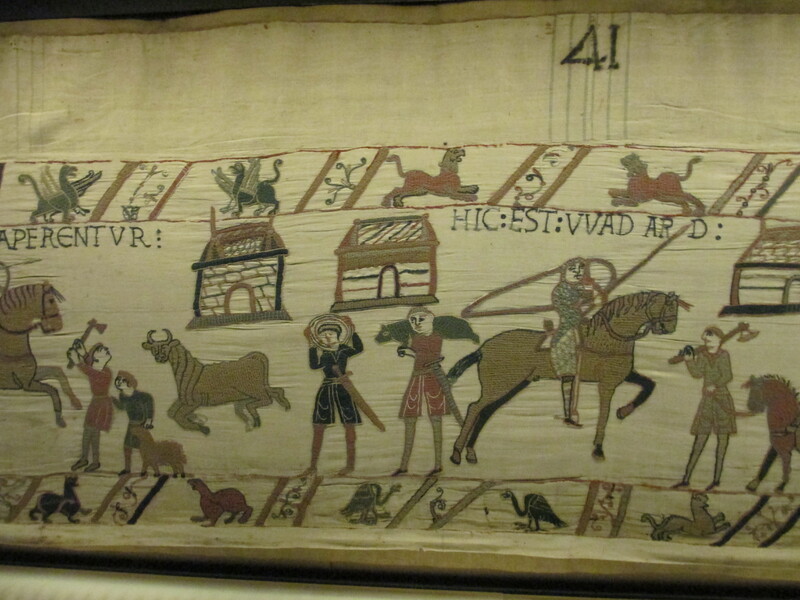 This is the situation when the Bayeux Tapestry begins. 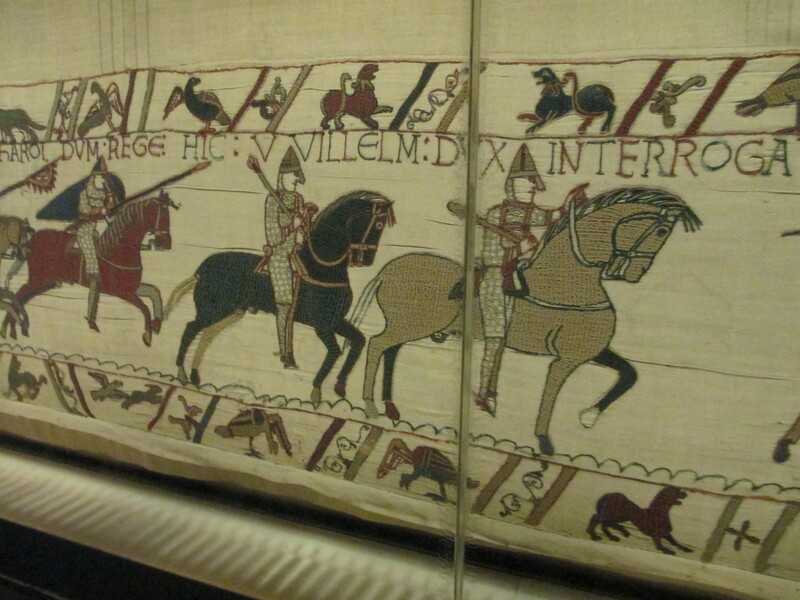 I have photos of most of the tapestry, but there are a few panels I missed when trying to photograph it around people. 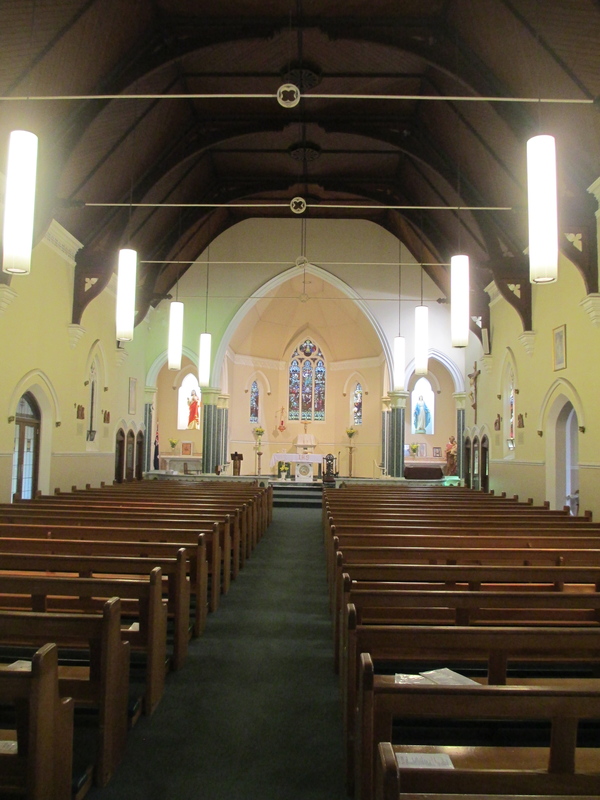 The photos below give a good general idea though. 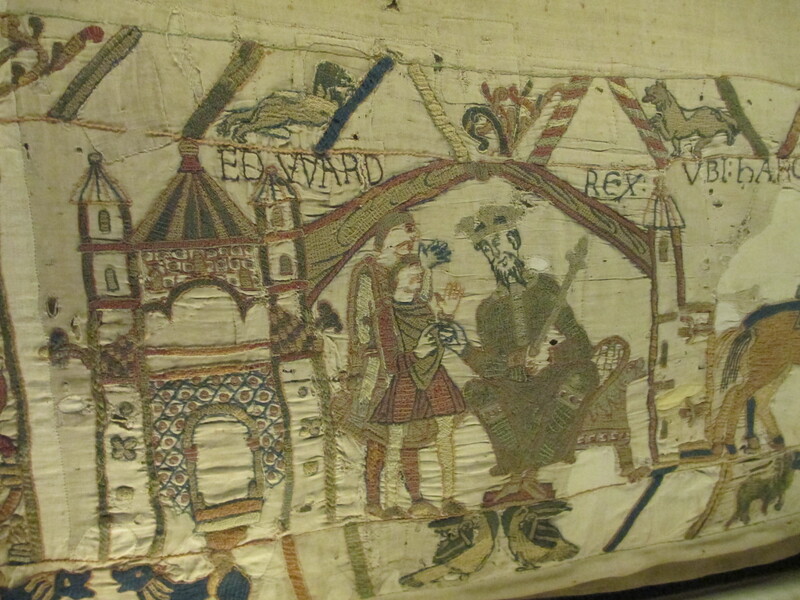 The story begins with an image of Edward the Confessor talking to Harold Godwinson. 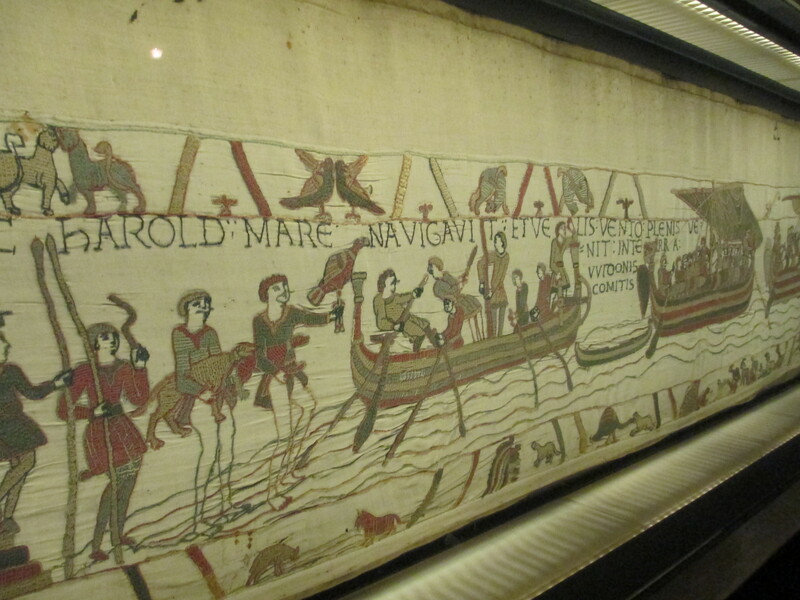 Harold is then sent to Normandy and he can be seen crossing the sea. When he lands he is seized by Count Guy of Ponthieu. And he is taken to Beaurain Castle where Harald and Guy talk. Duke William finds out about Harold’s capture. Duke William sends envoys to Guy. 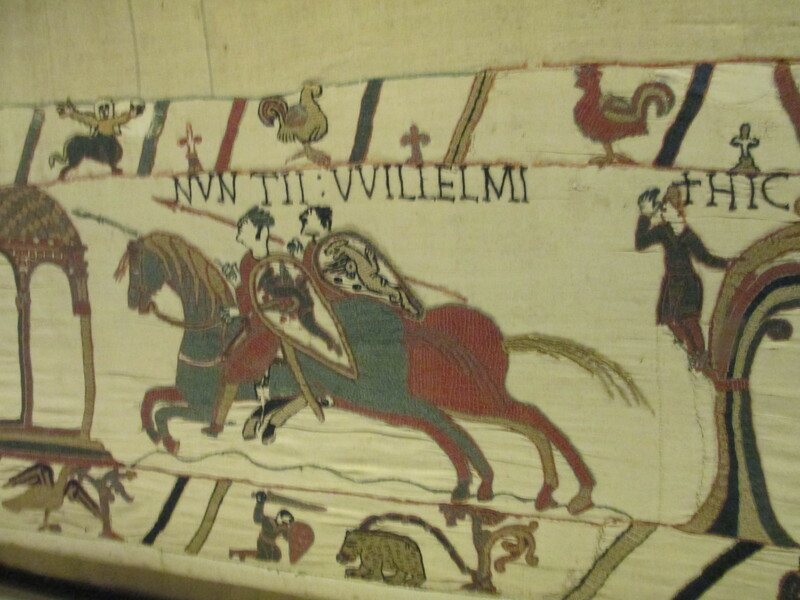 Harold is taken to Duke William, you can see Duke William below on the black horse. They go to Duke William’s palace. A churchman and Aelfgyva were at the palace. Aelfgyva was a woman who’s identity is unknown to the historical community, though there is much debate. 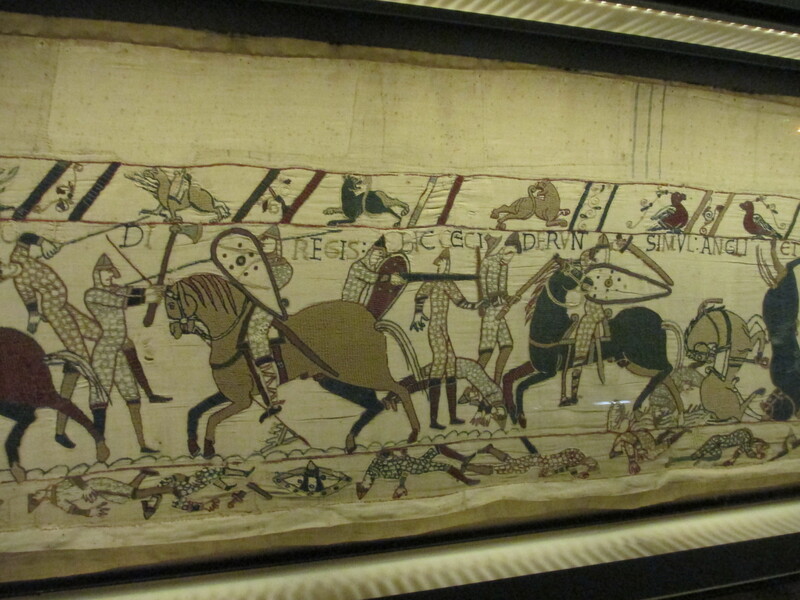 Then Duke William, Harold and Duke William’s army go to Mont Saint Michel. 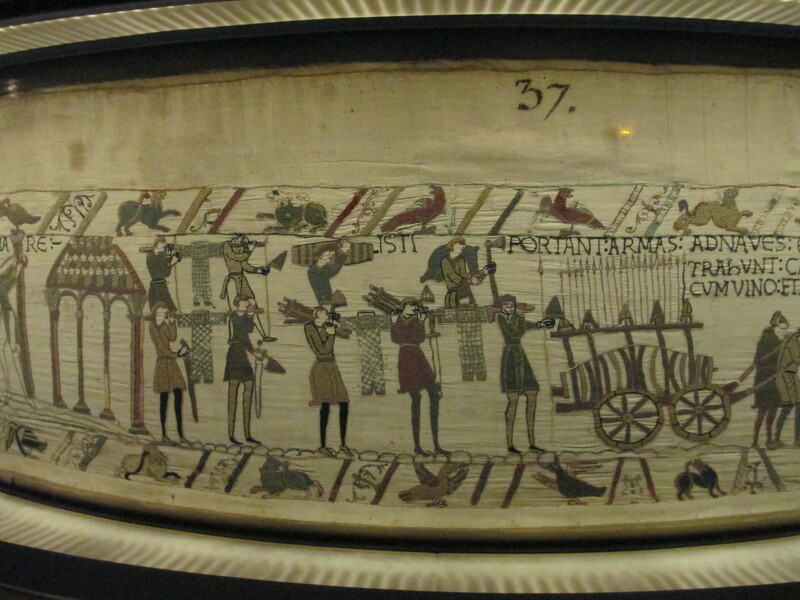 This is an account of Duke William’s campaign in Brittany. They cross the river Couesson. They arrive at Dol and Duke Conan of Brittany flees. You can see him doing it on the left. They then attack Rennes and are fighting against the men of Dinian. 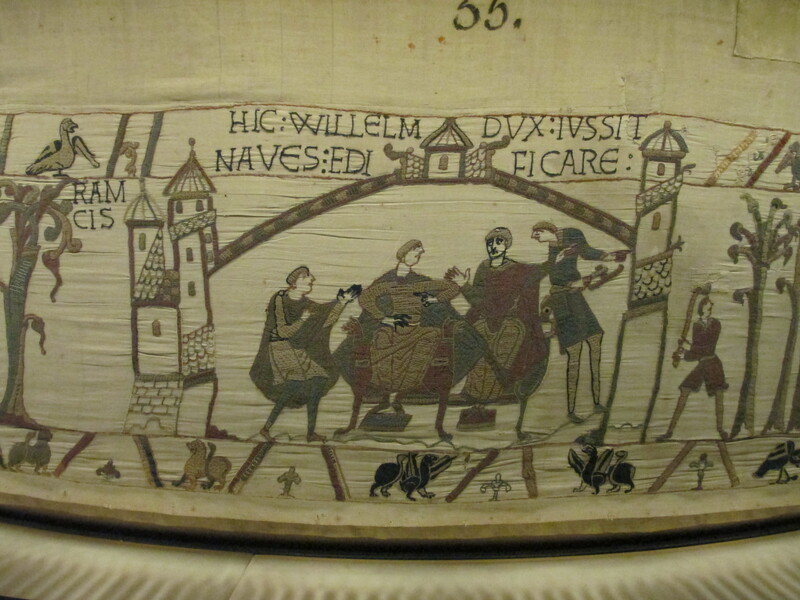 Conan hands over the keys to William, no photo, and Harold and William arrive at Bayeux, no photo, where Harold makes an oath to back Duke William. 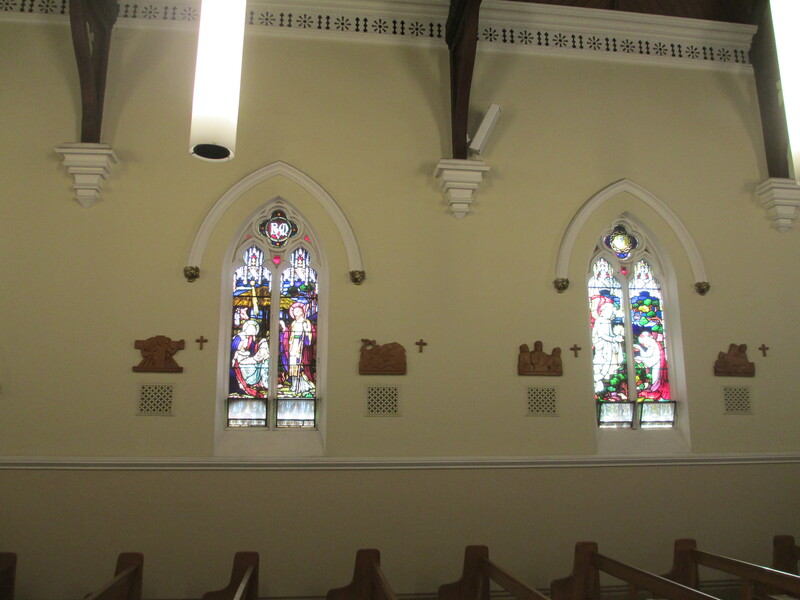 You can see him swearing on the holy relics on the right. 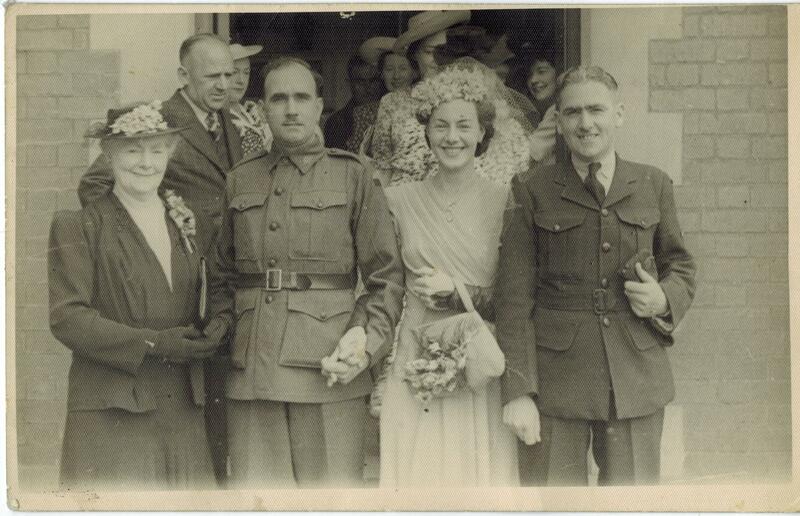 Harold returns to England, no photo, to find that King Edward is dying. 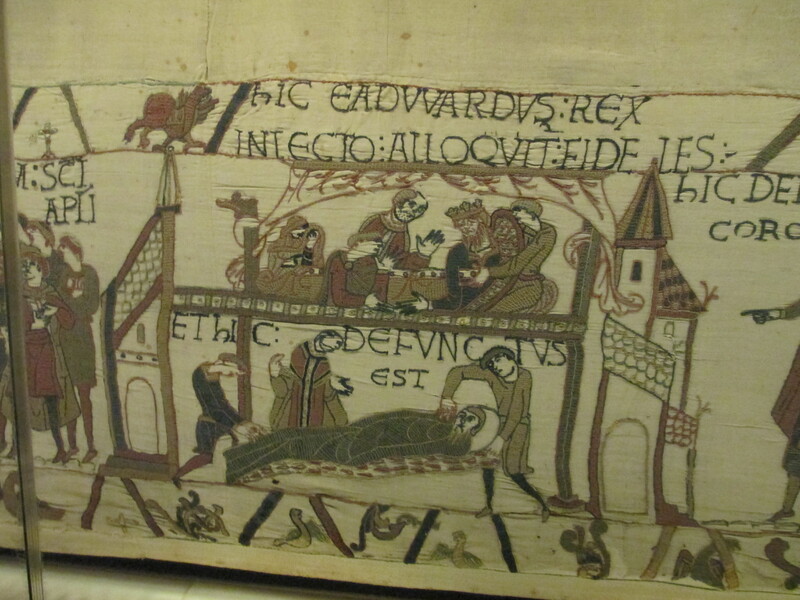 The Hand of God is pointing at the very new Westminster Abbey and King Edward’s body is carried off. King Edward is shown addressing his faithful servants before his death. The men marvel at a star, which is Halley’s Comet. One of them comes to tell Harold about it. You can see shadowy ships in the bottom border, which could be taken as an omen. Duke William is told of what he sees as Harold’s treachery. Duke William’s men are ordered to chop down trees to make ships and the ships are built. 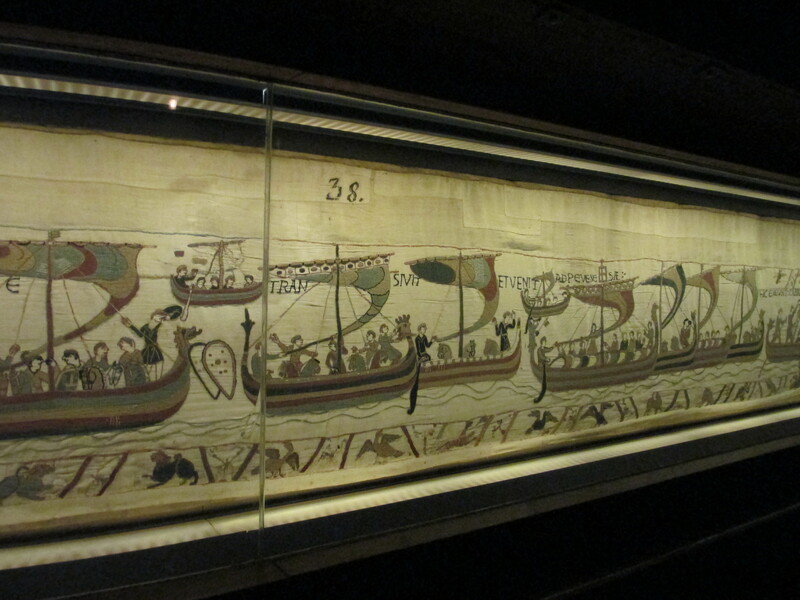 The ships are dragged to the sea, no picture, and loaded with weaponry and food and wine. They arrive at Pevensey, unload the horses and the knights hurry off. 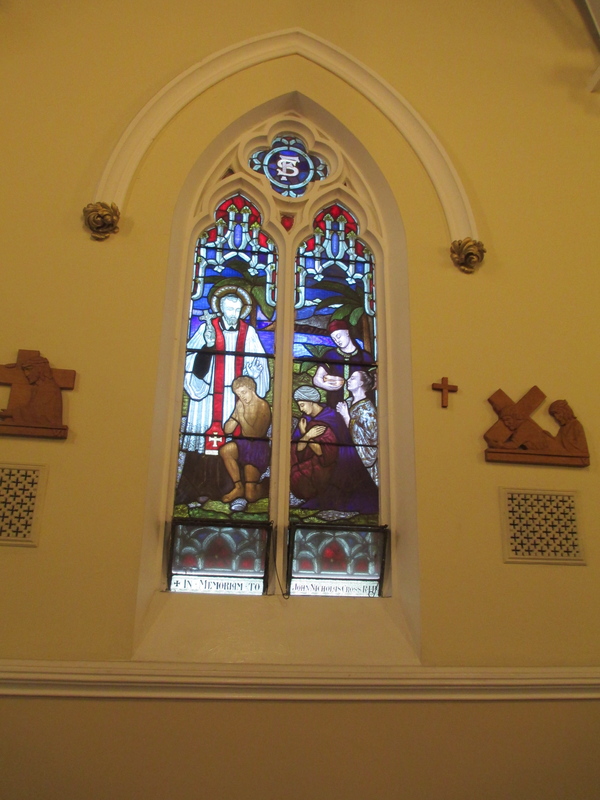 They can be seen hurrying on the right. They head for Hastings so they can forage for food, no pictures, they then arrive and meet Waddard, probably a vassal of Odo’s. Meat is cooked and served by servants, no picture. 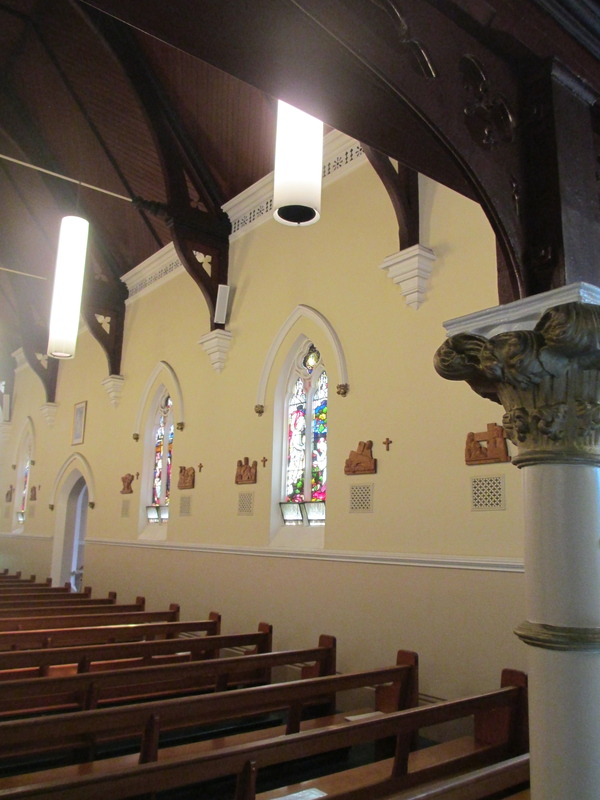 They have a large meal and the bishop blesses the food. Duke William talks to his two half brothers Bishop Odo and Robert of Mortain, no picture, the order is then given for a fortification to be dug at Hastings. News about Harold is brought to Duke William and a house is burnt, possibly an indication of the countryside being ravaged to provoke battle. 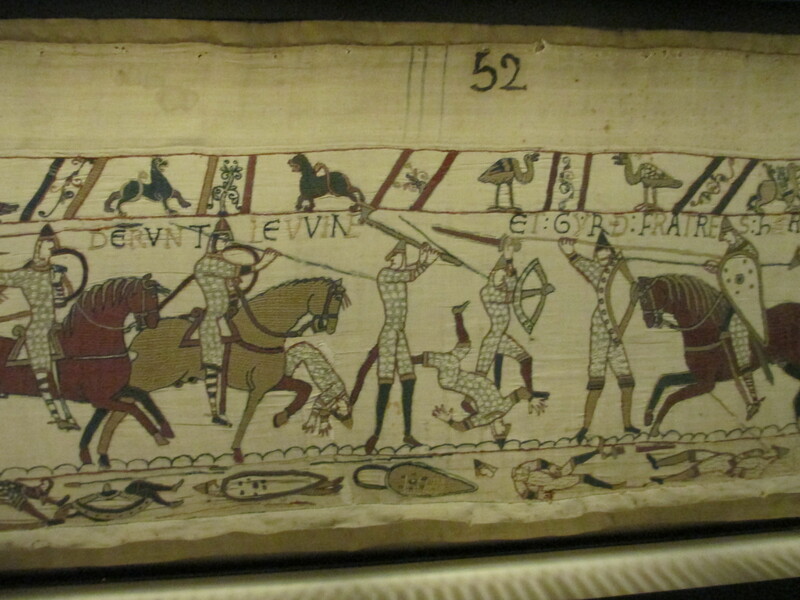 The knights set out from Hastings, no picture, and reach the battle against Harold. Duke William questions Vital, who was probably Odo’s vassal and has been scouting, if he has seen Harold’s army. 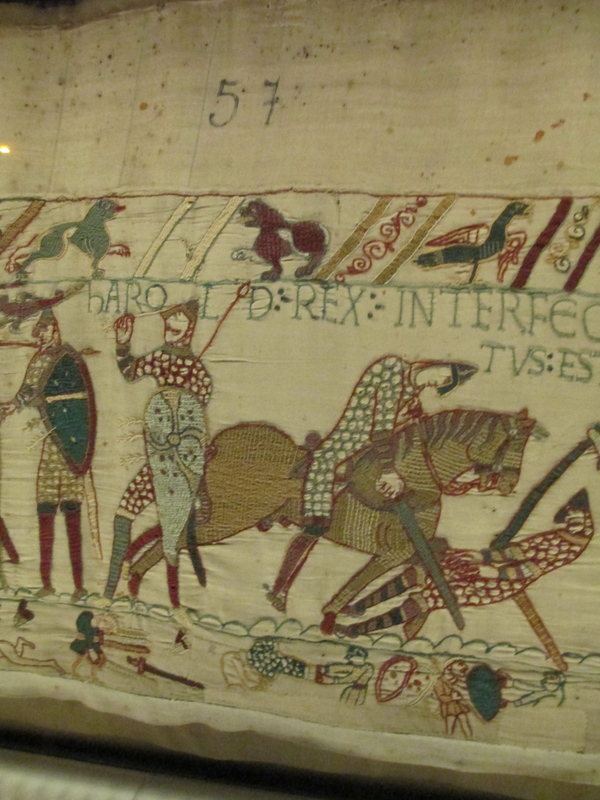 It is worth pausing the story here to say that at this point King Harold has ridden and marched his army from Stamford Bridge, just out of York. 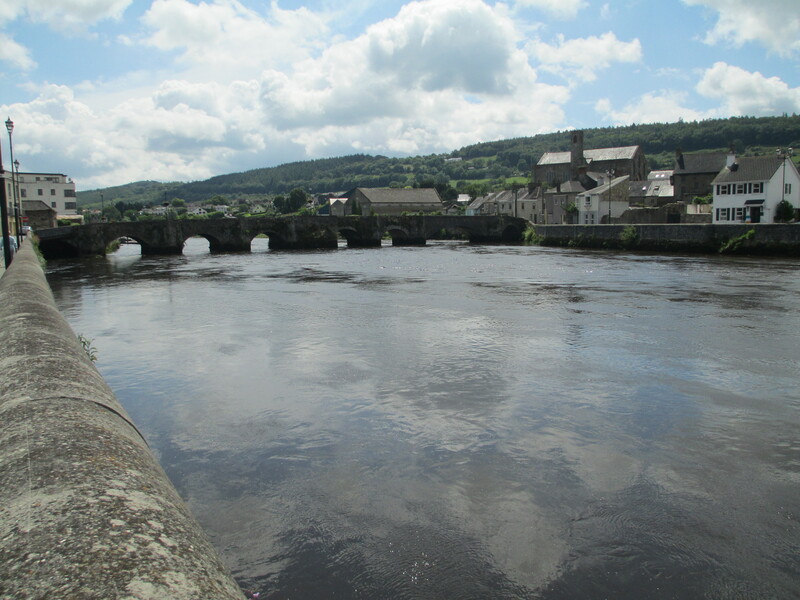 Where after a forced march of more than 200 miles King Harold’s forces had defeated the army of Harald Hardrada the King of Norway and Tostig, King Harold’s brother who he’d been forced to exile some months earlier. Harald Hardrada had sailed at Tostig’s request to claim the English Crown for himself. He’d sailed with a fleet of some 200 ships, not including the supply ships. King Harold won the day, the Norwegians were annihilated and Hardrada and Tostig were both killed. So few survived that only approximately 24 ships were needed to carry them home. 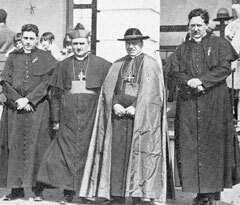 Oderic Vital wrote seventy years later that “To this day a great congeries of skeletons of those who died still lies there, as evidence of the wholesale slaughter of two peoples.” (Thorpe, p.15). 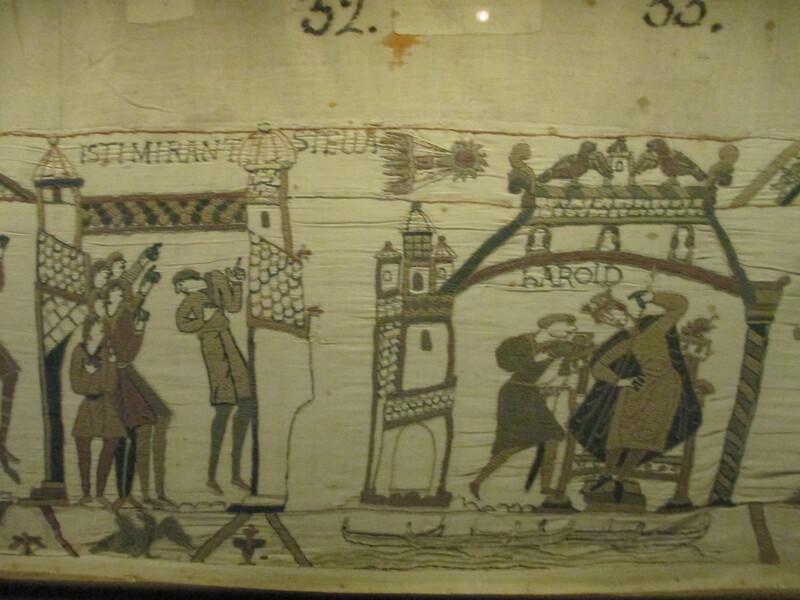 News of Duke William’s landing probably reached Harold while he was in York and he turned around and marched south from just out of York to face Duke William, he left London on the 12th of October and The Battle of Hastings was fought on the 14th of October 1066. 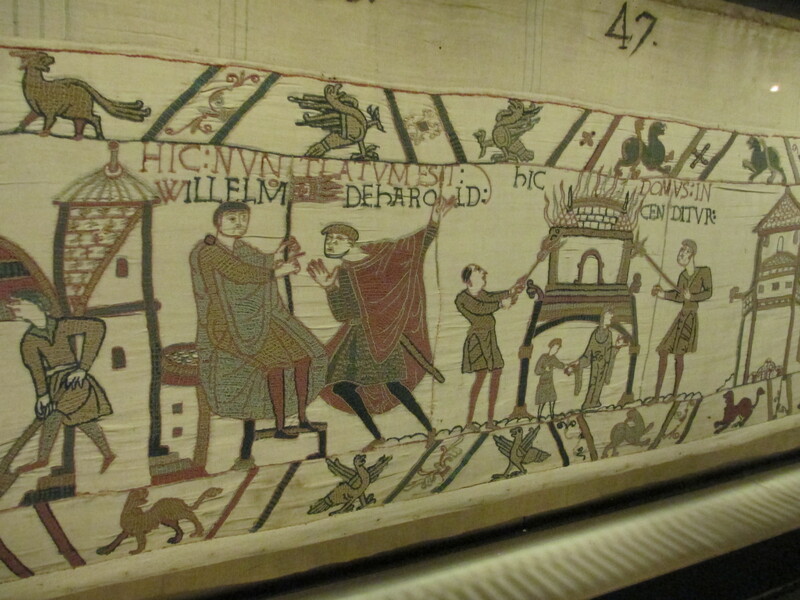 The image below on the left is King Harold receiving news of Duke William’s army before the battle begins and on the right you can see Duke William exhorting his troops. King Harold’s brothers, Leofwine and Gyrth, fall. There is concern that Duke William has been killed. You can see him showing his face below to prove that he isn’t dead. 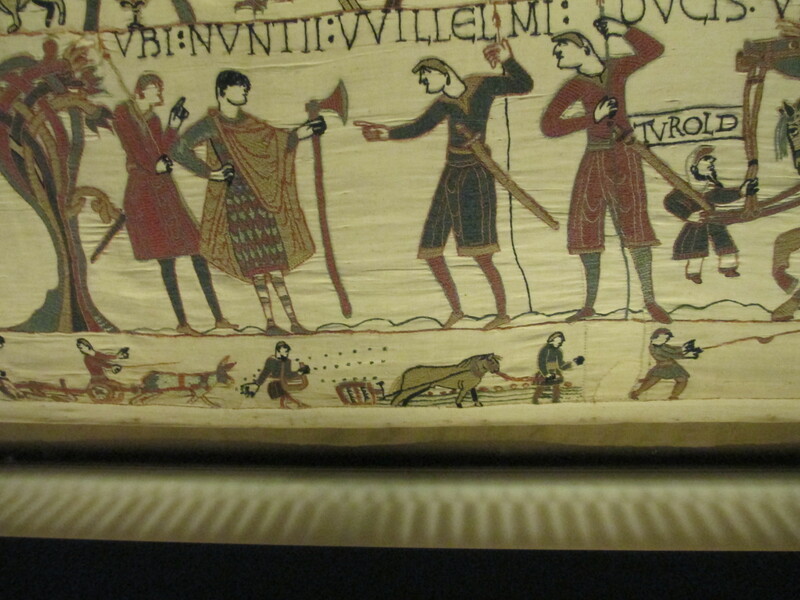 There is more fighting, no photos, and then King Harold is killed. 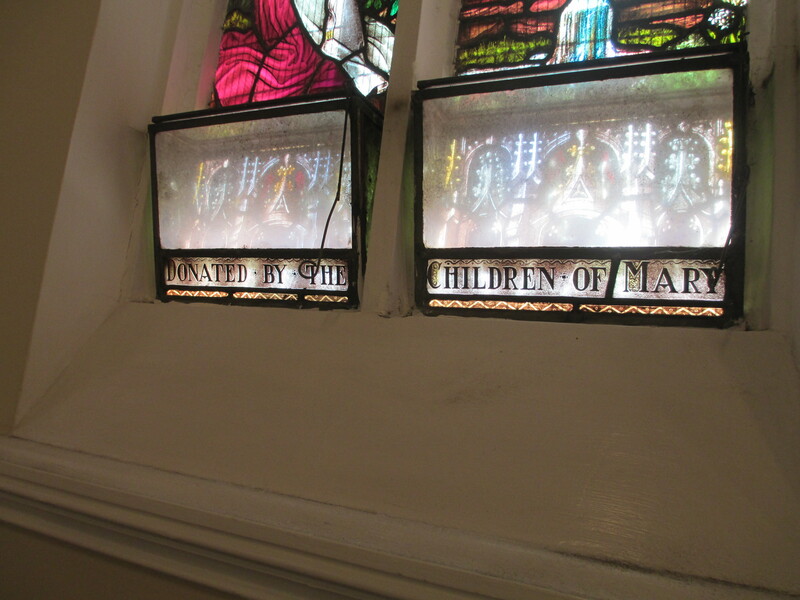 You can see latin below. Harold Rex interfectus est. 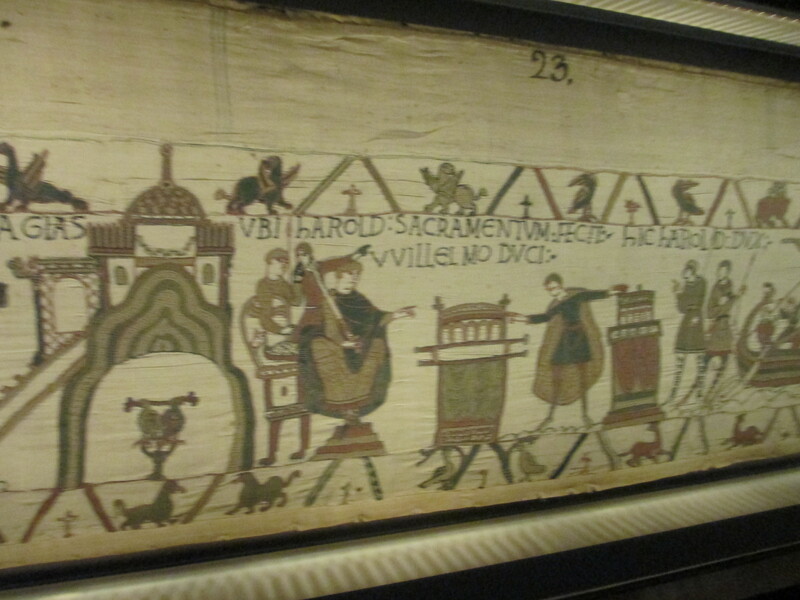 Which translates as here King Harold has been killed. See above for the discussion as to how he died. And that is the end of the tapestry. It is by no means the end of story as Duke William still had to establish dominance over a reasonably hostile country. But that is a story for another post. The photos are all mine as is the video. 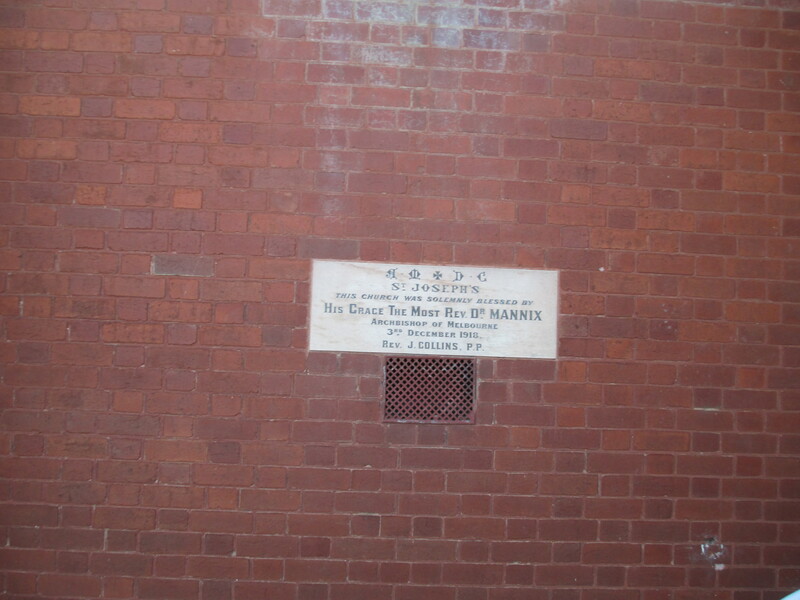 http://www.history.org.uk/file_download.php?ts=1254494939&id=3946. This is a link to a discussion about whether or not King Harold was shot in the eye. While the author draws the conclusion that he was not and I don’t believe this can be said absolutely definitively the article outlines the problems with the argument that he was shot in the eye with an arrow. There are absolutely arguments on both sides, but this is not the place to go into detail. 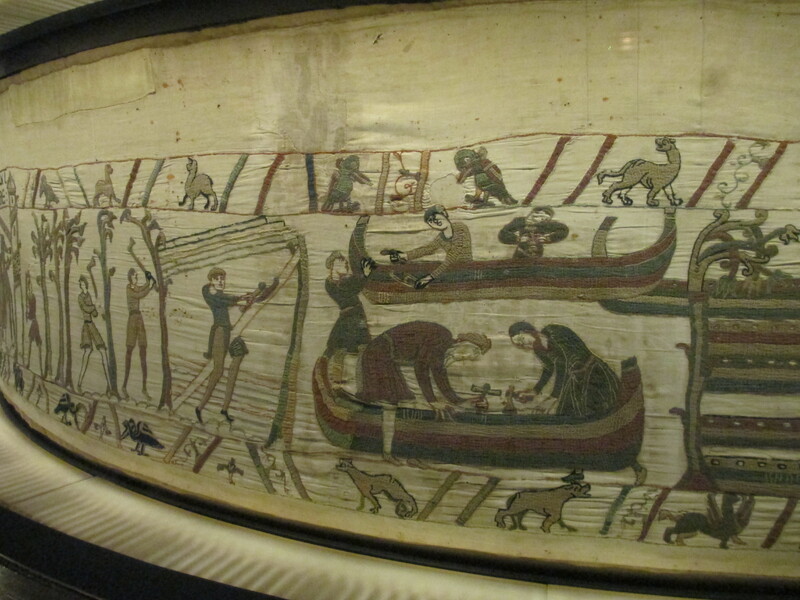 The Bayeux Tapestry by Eric Maclagan. published 1943 by Penguin Book Limited: London and New York. 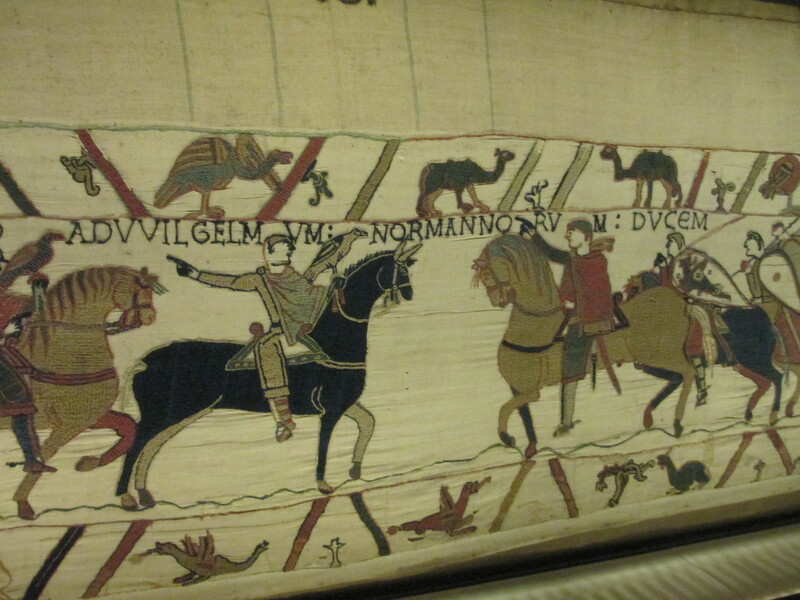 The Bayeux Tapestry and the Norman Invasion by Lewis Thorpe. Published 1973 by the Folio Society.